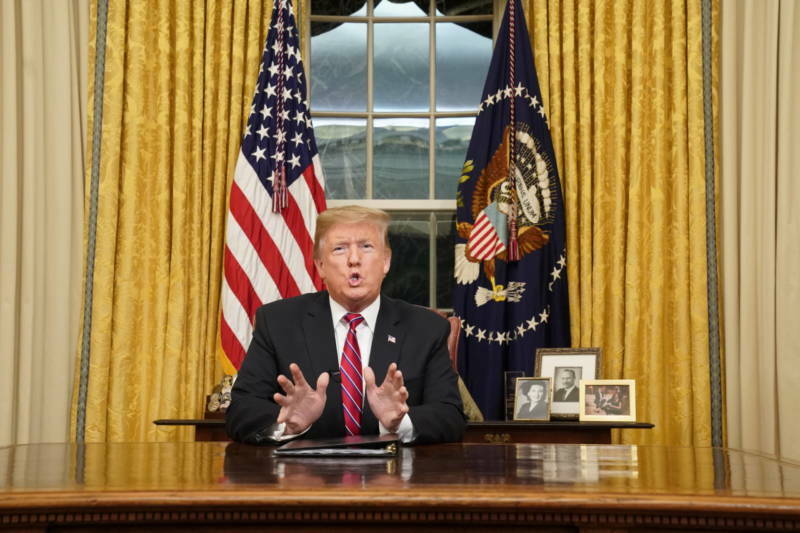 President Trump made his case to the American people Tuesday night why a massive wall along the Mexican border is necessary, using his first Oval Office address to outline his conditions for ending the 18-day-and-counting partial government shutdown. "This is a humanitarian crisis — a crisis of the heart and a crisis of the soul," Trump said, explaining why his request for $5.7 billion to build the wall and for additional border security measures was necessary. "The federal government remains shut down for one reason, and one reason only: because the Democrats will not fund border security," the president said. Unlike his campaign rallies, Trump didn't begin with his push for a wall. Instead, he first outlined what he says is an urgent need to address a growing number of migrants trying to cross the border and for drugs coming across illegally. "Children are being used as human pawns by ruthless coyotes and gangs. Women are being sexually assaulted. Women and children are the biggest victims of tragedy on southern border," Trump claimed. The Trump administration has tried to establish a link between terrorism and the situation at the southern border, and on Tuesday night said a "barrier is absolutely critical to national security." But Trump and his allies have often exaggerated the threat or simply used inaccurate or misleading statistics in order to do so. While there has been a spike in southern border crossings in the past few months — largely children and families fleeing violence in Central America — overall illegal crossings are lower than in either 2016 or 2014, and far lower than their peak around 2000. Trump asked for more funding for "cutting age technology," more border patrol agents (who are currently working but not being paid since the Department of Homeland Security is subject to the partial shutdown) and for more immigration judges. The president also claimed that "at the request of Democrats" any wall would be a steel barrier. However, that has not been a condition of Democrats. Rather, after long pushing for a concrete wall, Trump recently shifted to talking about using steel slats to build a barrier on the southern border, hoping that might convince some Democrats, but it has not. Democrats have remained in staunch opposition to any contingencies on reopening the government, arguing their victories in the midterm elections and public polling have shown the country doesn't want a wall on the southern U.S. border. In their response following Trump's address, House Speaker Nancy Pelosi, D-Calif., and Senate Minority Leader Chuck Schumer, D-N.Y., accused Trump of trying to "manufacture a crisis, stoke fear and divert attention from the turmoil in his administration." But Trump has said he won't sign any bill to reopen the government, about a quarter of which was shuttered on Dec. 22, unless Congress acquiesces to his request for $5.7 billion to build the wall — Trump's central campaign promise that received raucous applause at his rallies, albeit with the caveat that Mexico would pay for the barrier. Last month, Trump said he would be "proud" to shut down the government over border security and would gladly "take the mantle." However, since the partial shutdown became a reality, he has tried to shift the blame to Democrats. Trump also tried to make the argument that the wall would be paid for, indirectly, by Mexico thanks to a new trade deal he has renegotiated to replace NAFTA. However, that new deal has not been ratified by Congress, and as NPR's Tamara Keith has reported, there's no guarantee the economic gains could pay for the wall, and the White House has not explained its math to back up that claim. White House press secretary Sarah Sanders also claimed last week that Customs and Border Protection picked up almost 4,000 suspected terrorists along the southern border, but NBC News found those stops have largely been made at airports. During the first half of fiscal year 2018, CBP stopped just six immigrants at ports of entry on the southern border who were on a federal terrorist watch list, NBC also found.